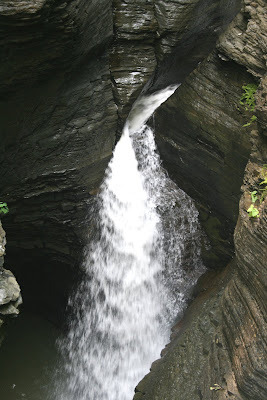 I took some photos at Watkins Glen Gorges in upstate New York. 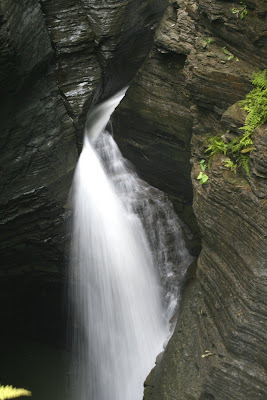 The area was beautiful, but it was an overcast day and kinda dim in the gorges. I'm still learning about exposure, and camera-shake, and all that. Thus... I did not get many photos that were crisp or blogworthy - but I wanted to post up some experimental photos to show what shutter-speed adjustments can do. Shutter priority mode (tV) set at 1/4 sec and f/20. I had an ND filter on standby, but this was a shady area and was unnecessary. I didn't have a tripod so this was just loosely propped on a wall. The second photo isnt as crisp but its not bad. I definitely like the whispy look of the water streaming, over the 'frozen-in-action' shot above it. The difference is much more dramatic in the second set of photos.